The LI190R, manufactured by LI-COR, is a quantum sensor that accurately monitors Photosynthetic Photon Flux Density (PPFD) in both natural and artificial light. It has a voltage output and is ideal for growth chambers and greenhouses. The LI190R measures solar radiation with a silicon photovoltaic detector mounted in a cosine-corrected head. 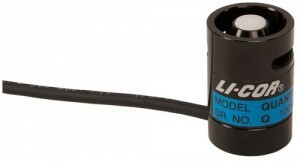 A shunt resistor in the sensor’s cable converts the signal from microamps to millivolts, allowing the LI190R to be measured directly by a Campbell Scientific datalogger.